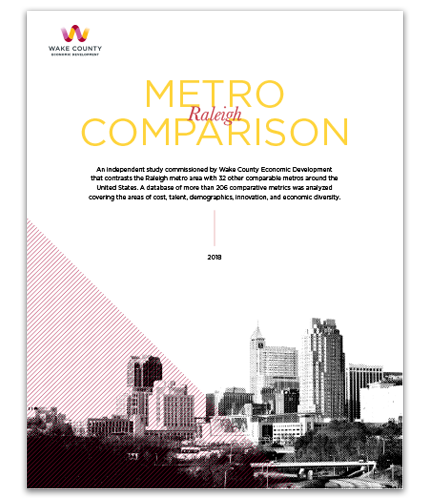 The Metro Comparison is an independent study commissioned by Wake County Economic Development that contrasts the Raleigh metro area with 32 other comparable metros around the United States. A database of more than 206 comparative metrics was analyzed covering the areas of cost, talent, demographics, innovation, and economic diversity. The study revealed that, although the Raleigh metro is smaller than competitors, it consistently “punches above its weight,” outpacing other larger communities in many of the metrics utilized in the study. A series of five indexes (Cost of Doing Business, Talent, Global, Momentum, and Future) were created to aggregate the indicators and highlight key business growth and site selection decision factors. This comparison revealed that, despite powerful competition, the Raleigh metro is one of the strongest in the U.S. and is certainly the most competitive. The Raleigh metro sets the bar for how a region can adjust and adapt to changes in the economy and continue to experience incredible regional growth. The area has key strengths that propel a region forward, including talent, top-ranked education options, a strong business community, and a high quality of life. Raleigh is home to a growing population full of small businesses, corporate headquarters, innovative companies, and a variety of cultures, all of which impact the strength of our region. To download the Raleigh Metro Comparison, click here. For data and research questions, please contact Morgan Ross.